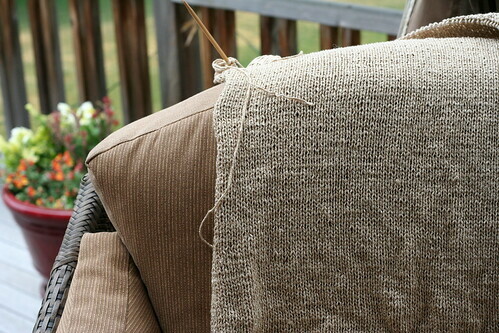 My current work in progress: a wrap cardigan made of oh-so-trendy bamboo yarn. It is so dreamy. I like to rub it on my face every few rows .... oooooh so bamboo-y. This is also a picture of my favorite place to knit, fantasy deck! I haven't been too creative lately, just churning out rows of bamboo-y goodness, so I don't have many projects to show. 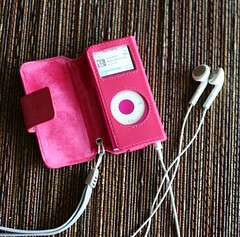 But I have been delving into the world of creative podcasts on my new iPod. (Yarnstorm and I took the same picture ON THE SAME DAY. whoah.) One of the creative prompts in one of these podcasts was to do a self-portrait. Easy enough, I thought. Then I listened to the reflections on self-portraits, making them meaningful, true to who you are, representative of you at this moment. Geez. Now I have to decide who I am before I can capture myself. But I think that is the whole point. Anyway, here is my attempt. It wasn't intended to only be my chin, but then I kind of liked the mystery of it. I am so in love with my ipod right now, it should probably have been in this portrait. I never thought I'd be gushy and permanently attached to it, but there you go. It holds so much love--podcasts by mommies and knitters and cooks and jane austen lovers, little photos of Bella, music for different moods. Now it is a special treat to go to Cub after Bella is in bed and listen to a podcast while I get heaps of groceries, or mow the lawn with some bouncy tunes, or do some work with a little motivational music. Ahhh, life is fun again. I hold Brent entirely responsible for this, since he was the one who sniffed out that I would like an iPod. I told him that I didn't need anything so disgustingly trendy and expensive, I had a perfectly good DISCMAN thank you very much. But he and Bella went to the mall and picked it out while I was gone on my uber-awesome scrapbooking weekend and I got it for my birthday. Including a matching hot pink case AND some kind of fixit plan for when I break it, which just puts the whole thing over the top. My only regret is that he didn't do any romantic engraving on the back. "To my heart and soul, love B" or "You complete me, love B" Those would have been fine. Maybe I'll just do it myself. I'll end with a Fair countdown: 56 days and counting. Here is Bella, braving the wilderness at Savanna Portage State Park. She got to enjoy gatorade, mud puddles, waking with the sun, and walking around the campground pointing out the doggies. Woof! I laid in the tent one morning thinking, This is harder than I thought it would be. 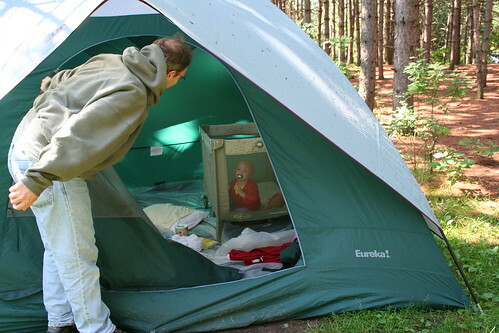 Camping with a toddler. And I actually said outloud to barely-conscious Brent, "At least we're not civil war re-enacting." But I really believe that families who camp together are more fun. I think of all the especially fun kids I grew up with and they were all campers. 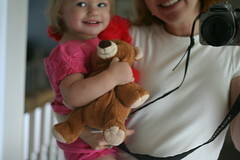 My favorite Girl Scout camper from my counseling days was a family camper. The kids at the campground were all fun. All signs point to, CAMPING=FUN KIDS. We're just at kind of an awkward, but-I-WANT-to-jump-in-the-fire phase that makes camping kind of stressful. I have faith that if we press on, we will become family campers. Brent will humor me in this, I believe. If I make a tradition of the Mountain Man Bake. 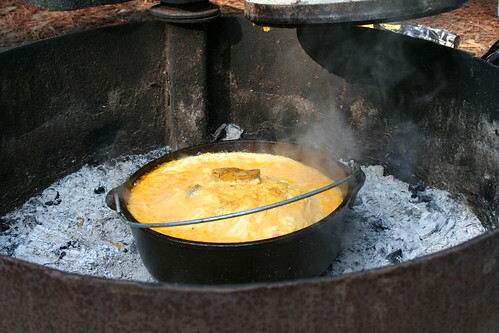 (seen here hidden in it's dutch oven of cozy cheesy eggy goodness). We did end up coming home a night early. Partially because we got soaked and mainly because the sun comes up really freaking early. And one guess what other chipper little thing is up with the sun. So we were snug at home for Father's Day, which meant Bella and I got to make Brent a blueberry pancake feast. Except Brent ate leftover Mountain Man Bake, because really it's Mommy who loves blueberry pancakes. Selfish Mommy!